We have two potentially contradicting ideals: we like to try new dishes and recipes and we don’t like to waste food. The contradiction occurs because the former often requires us to buy ingredients for new recipes that we only use part of and then they hang around in the cupboards for ages because we don’t like to throw them away. Sometimes though, attempts to use up these ingredients can work out very well. That is what happened on Thursday evening when we decided that we really needed to use up the various half-packets of rice noodles that we had open. Heat a wok over medium to high heat. When it is hot, add a little vegetable oil and then add the sliced beef. Stir frequently to prevent it sticking or burning. After a minute of stir frying, add a teaspoon of fish sauce and after two minutes add another teaspoon. After three minutes, remove the beef to a plate and return the wok to the heat. Add a little more oil and the onion, garlic and chilli. 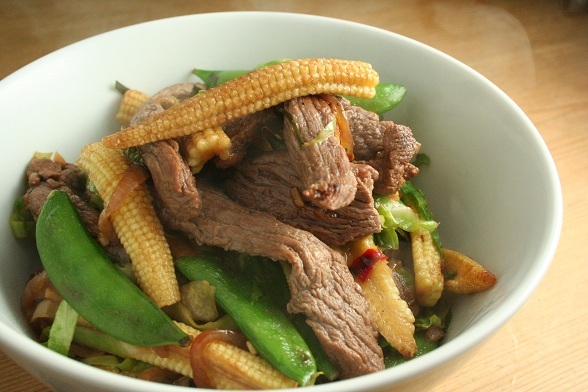 Stir fry over high heat for one minute, then add the baby corn. After one minute, add the mange tout and the sliced lime leaves along with a tablespoon or so each of soy sauce and fish sauce. You can vary the amount of the soy and fish sauces depending on your taste; I tend to add quite a lot of both of them because I love the strong, rich flavours that they impart but that might not be everyone’s preference. After another two minutes, add the beef back to the wok along with a splash of water, then turn down the heat and put a lid on it. Let it steam for a few minutes. Then remove the lid and add the lime juice and any more soy or fish sauce that you want to for seasoning. Back to what started the whole thing – the rice noodles. We had two types; one that needed to soak in hot water for five minutes and one that needed fifteen. Having soaked and then drained them both, once the stir fry was cooked we put it into a bowl and added a little more oil to the wok. Added a little more onion and garlic to the wok for 30 seconds, then added the noodles and stir fried them for a couple of minutes before serving. As I said in the comment at the beginning of the post, this rather made-up dish turned out very well. Adding the fish sauce to the steak while stir frying it imparted a wonderful umami flavour to it while it still retained its innate steakiness and reminded at times of eating in a good steakhouse. Clearly the butcher had supplied us with some really good steak. I was worried that a lack of ginger or lemongrass would let the dish down, but the lime leaves and lime juice picked it up and it didn’t lack anything. Delicious. Subscribe to comments with RSS	or TrackBack to 'Thai Beef Stir-Fry'. The best recipes often come from leftovers! My fridge is full of half jars of pastes and ingredients purchased for specific recipes which now need using up. I must get inventive! I know exctly what you mean, Antonia. Hence last night’s puttanesca. Good luck!